Skip the line. Snacks and drinks are at your fingertips. We’ve made your moviegoing experience even easier. 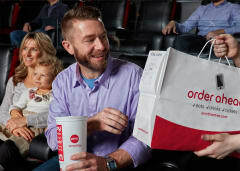 Order your favorite food & drinks before you even arrive at the theatre. Available now at participating locations. Don’t see your theatre in the list below? Keep checking back – we’re constantly upgrading more locations with Order Ahead! Order your favorite eats and drinks. Tell us when you're coming. 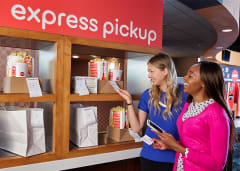 When you arrive, look for the express pick-up kiosk located near the concession stand. We’ll have your order ready. Fast, delicious and always fresh. Head straight to your auditorium and get comfy. We’ll deliver your order right to your seat!